Mention the words "5K race" to a group of walkers, and they'll look at you as though you said, "Line up for the firing squad, please." Even the most avid fitness walkers get the heebie-jeebies at the thought of competition. So why are we bringing it up? Because entering a 5K can refocus your fitness walking program and reenergize your commitment to getting fit. Setting concrete, attainable goals such as walking your first 5K race is a great way to elevate your fitness walking program to the next level. Building up to a 5K race is quantifiable, so you'll be sure that you're succeeding. And by giving yourself eight weeks to prepare for the 5K, you can break down the additional distance you need to walk into smaller increments. "5K" is athlete lingo for a 5 kilometer walk/run. Five kilometers equals 5,000 meters or 3.1 miles, which translates to about 12 ½ times around a high school track. A 5K is the shortest of the distance races, but it's long enough to be a challenge. While some walkers and runners compete for first-place honors, most sign up for the fun of it. Awards are often handed out just for participating, not only for being the fastest. Committing to a 5K can be powerfully motivating, because you'll naturally want to do well. And with the eight-week 5K training program, you can definitely enhance your performance. Setting a goal to complete a 5K renews your sense of excitement about weight loss. Increasing the intensity of your workouts in preparation for race day builds your speed, boosts your strength and endurance, and maximizes weight loss. Concentrating on technique and training rewards you with a sense of pride, mastery, and accomplishment, all of which give you the confidence to try something new and succeed. Each week of the training program follows the same pattern: three days of workouts at varying speeds, alternating with three days of walking at a brisk but comfortable pace for up to one hour. One day a week, preferably the one following your hardest workout, is for resting. Adequate rest reduces your risk of injury, which would likely disrupt your training. If you want, you can use your day off for activities other than fitness walking, such as bicycling and swimming. Every week, your workouts get a bit more intense as your speed, strength, and endurance improve. Then in the week leading up to race day, your workouts taper off. This gives you an opportunity to rest, so that you're feeling fresh and strong for the big event. 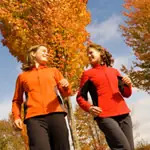 The 20s: Warm up by walking at a moderate pace for 10 minutes. For the next 20 minutes, walk a bit faster than you normally do. You should feel a little winded but able to carry on a conversation comfortably. Cool down by walking slowly for five to 10 minutes or until your breathing has slowed to normal.